Another Will Play For For event was held in LA on August 18th! Thanks to Lisa and her sister-in-law. What a great idea to turn a birthday party in a WPFF event!! Please let us know if you are having, want to have, or need help planning your own event!! Follow these links to see pictures of the events around the country! Can't wait to see more! I'm very excited to announce that we are having multiple events across the country this month. If you would like to host a food group we would love to have you! It's easy! It can be 3 of you in your back yard or 100 parents and kids in your local park. If you don't know how to contact your local food bank we'll help you. Food banks across the country are in a crisis and we can make a difference. Our kids can make a difference. Quick! 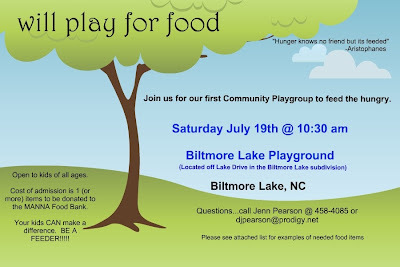 Grab your kids, grab some non-perishable food and head straight to your closest WPFF playgroup. Check our blog for upcoming events and if you don't see one in your area, start your own. It's easy! All you need is a couple friends (or more) and a giving spirit. If you do not see your area represented than you are just who we're looking for. Send us your name and your local food bank's information and we'll get you listed. 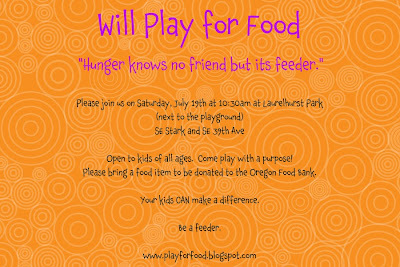 Help your kids make a difference and come play with a purpose. 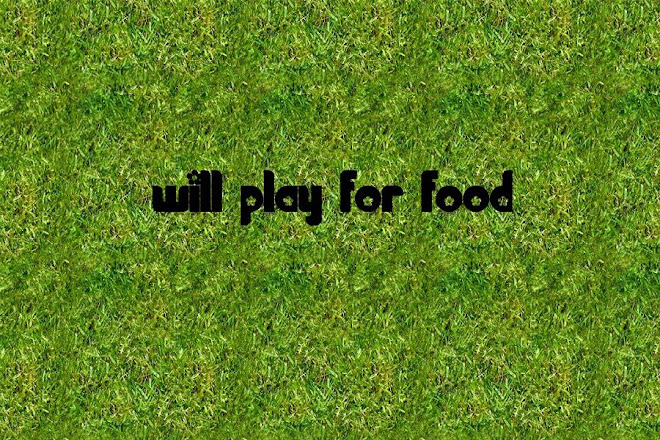 "Hunger knows no friend but it's feeder."